The full-frame digital SLR megapixel race has a new champion: the 21.1-megapixel Canon EOS 1Ds Mark III. 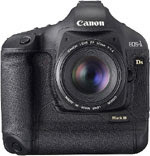 In this case, the only other contender in the race is Canon's own 16.7-megapixel 1Ds Mark II. While most serious photographers don't need more than 8 to 12 megapixels, there is a set of pro photographers who need every last bit of detail a camera can give them. Long hailed by many as a rival to medium-format digital cameras for less money, the 1Ds is extremely popular in the professional portrait and fashion photography world. With the addition of nearly all the advancements and interfaces improvements of its higher-speed brother, the 1D Mark III, the 1Ds Mark III is likely to be even more popular with high-end pro photographers.